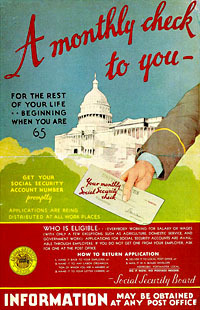 I think Very Serious People concentrate on Social Security because they can understand it. The program is relatively simple and the math straightforward. The ultimate driver of most projections — that there will be more retirees than workers — makes sense. Reasoning about long term health care costs and affects, economic growth rates, global convergence, the importance or lack thereof of skill biased technological change, etc is more difficult and therefore I think people shy away from it. feel as if they know the right questions to ask and could even potentially push back on some of the things I am saying. This confidence makes them want to steer the conversation in this direction. Anyway, Prof. Smith was responding to Prof. Krugman, who suggests that elites are gung ho about cutting Social Security as a way of demonstrating seriousness because they themselves don’t rely on Social Security and don’t know an awful lot of people who do. So they’re eager to support things like raising the retirement age. After all, it doesn’t much affect those of us who sit on our butts for a living and can retire early anyway because we have plenty of savings. If I had to guess, I’d say Krugman explains about half the elite response, Smith explains about a quarter, and then there’s another quarter explained by pure partisan bile and ideological purity. But that’s just a guess.